UPDATE: You can read about the results of our further investigation into this story here. 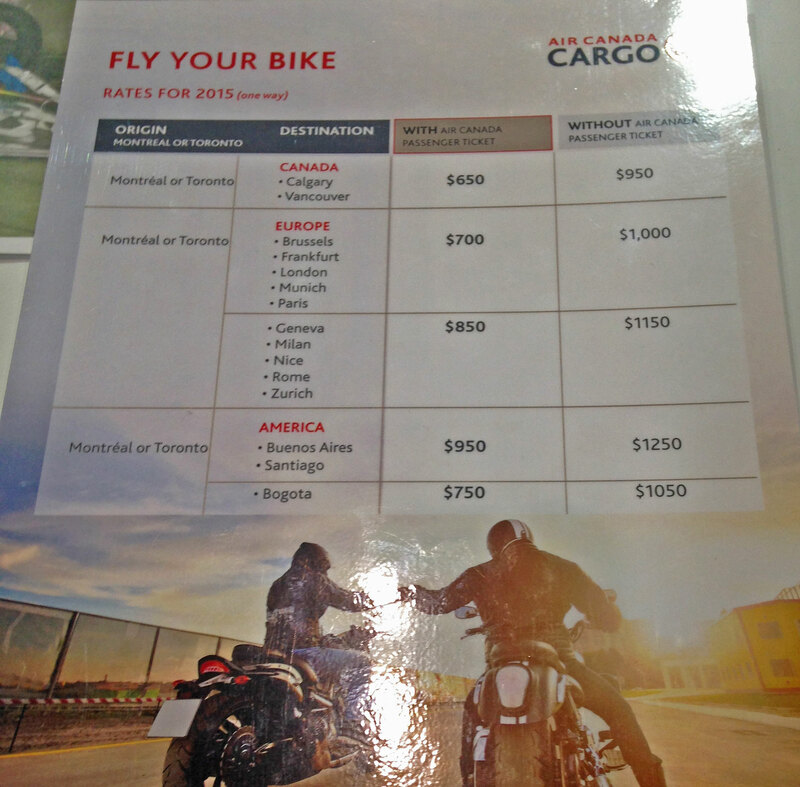 At the Toronto Motorcycle Show we came across an Air Canada booth advertising some pretty decent rates to fly your bike to various parts of the globe. For example, $950 to South America means that you can fly down with your bike and do that dream Americas ride without having to go there AND back! Same for the cross Canada trip at $650, or maybe a return trip to Europe ($700/$850) and save the cash on the bike rental. Either way, for the would-be adventurer who is tight on time, this Air Canada initiative opens up the world, literally. We contacted Air Canada’s Antonio Sammartino for more info and sent him our questions. he sent back the answers and a whole lot more so we pasted it all below in a Q&A format. What do I have to do to prepare for my motorbike to be shipped as dangerous good? Motorcycles are classified as dangerous goods in international air transport. The booking agent will provide information on the documentation requirements and process for preparing the motorbike for transport. You can also contact Doug at Dangerous Goods Packaging Limited. 205 Matheson Blvd. Unit 10 in Mississauga. 905-890-7066 ask for Doug. or email: doug@dangerousgoods.ca. (see comment at end). Apologies for the snapshot, but it’s clear enough to see the actual prices and they seem pretty good to us. We offer two types of rates for each destination. Rates depend on whether you travel with Air Canada to the same destination as your motorbike or not. Our rates are one way in Canadian dollars (CAD$). Same rate applies for return shipment. Price includes: fuel, security surcharge and navigation tax. Additional charges may apply based on local charges at origin or destination, screening charge (0.15 CAD$/kg) and Dangerous Goods fees. Please contact your local Air Canada Cargo office for our special pricing. Your motorbike will travel on the same aircraft as passengers, arriving at the same time. Recovery time at destination can be longer than 4 hours sometimes if the motorbike is shipped on the same flight as you. Therefore, it can sometimes be preferable to book and ship a day prior to your travel date. This will avoid you waiting at your destination. The motorbike can be tendered at our facilities up to 24 hours prior to departure time. The latest time a motorbike can be tendered is 6 hours prior to departure of the booked flight (assuming paper work is complete and motorbike is ready to be shipped). Usually the freight is tendered at the same time as the Dangerous Goods Documents are processed. Normally inspection and tender takes no longer than 1 hour. We can book your motorbike on the same flight as you, however it would be preferable if it is booked and shipped a day prior to your travel date*. This will avoid you waiting at your destination. Recovery time at destination can be longer than 4 hours sometimes if the motorbike is shipped on the same flight as you. Yes, we offer damage insurance at $3.00 per $1000 insured. Coverage is for damage incurred during transportation by Air Canada Cargo. For additional coverage please contact your local insurance company. Who will do the customs clearance at destination? The person who will pick up the motorbike at destination. Usually it is the consignee. Ideally, soon after you have booked your flight and up to 2 weeks ahead of departure, to a maximum of 30 days. This would ensure a booking for your motorbike, however you may not get space on a desired flight. I looking to go to Toronto from Gatwick(or anyBritish airport) and want to take my Harley any idea what the all around cost one way would be? Wow, I just requested the cost of shipping my Moto Guzzi V7 II from Vancouver to Paris and AC quoted an astonishing $3520.12 CAD one way. I am shipping my bike via air Canada to Paris, has anyone done this? Do I have to purchase what they call green card insurance to ride in CEE European countries? Sorry to hear air Canada will not fly motorcycles into or out of Mexico. Why would you book a passenger ticket only to find out air Canada won’t fly your bike to your destination? Why wouldn’t you check they can fly your bike before buying tickets? Just seems like common sense. I was wondering if Air Canada was offering this again this year; I emailed them and got a response back that they won’t know till mid-March. Hoping to fly to Calgary this summer and ride in the rockies. Esteban, call 1 800 387-4865, Darlene Scott helped me in Toronto, ask for her. Safe travels. You have to fly it from London to a Canadian airport then ride it to LA or ship it on a truck/lorry. PS, will you bring me 10lbs black puddings from Bury market!!??? I made phone calls and sent emails on this offer until I was satisfied that I’d never figure it out. Don’t really know as of this date how I’m getting my bike to Colombia in November for a run south to Tierra Del Fuego. Did anyone find antonio sammartino email to ask about this? Craig, my name is Marco and im planning to go to Argentina, im a wolrd traveler, Im near Vancouver and I want to know how was everything and how much did you paid to ship your bike to Buenos Aires, Thank you very much for the help! Keen to read about successful shipments to South America. The prices mentioned are in the general range that I have read about air lifting from Panama to Colombia. If South America is the target of adventure, then shipping from Canada makes sense. There are only a few sail boat options between Panama and Colombia, arranging for a sea container takes considerable effort…and the ferry (Ferry Express) is suspended. Factoring in the minimum road time to Panama from the Texas/Mexico border, about ~10 days for most riders…add in border crossing fee, insurance, gas, food, hotels (OK, hotels are really cheap) and it really start making sense to air lift with Air Canada. I’ve been working out a budget in my head to buy a light dirt bike from a tour operator in Peru and tearing around for a few months, but taking my own F800GS that is already broken in on a 9 month CA/SA trip, well its sounding better and better. Thanks for the info. Looks like it’s only a deal if you’re going to be on a trip for at least a month. I guess I’ll be renting. BTW, if anyone is looking for an affordable motorcycle tour in Europe, Try http://www.bikespana.com/index.html . I went with him a couple of years ago and had a great time. Top notch. Post here if you’d like to hear about my experience with him. This is the quote I got for a 800GS from Montreal to Calgary… A hell of a price difference from 650 to 932$ !! If anyone actually goes through with this I would appreciate a step-by-step evaluation of the process. Any hiccups in the system, things to be aware of, extra costs etc. I’m thinking of doing this in the summer of 2016. If it’s not too big a hassle, I’ll go through with it. Furthermore, I’d be the contact, if you’d like, for the dangerous goods documentation and inspection. Contact us at Dangerous Goods Packaging Limited. 205 Matheson Blvd. Unit 10 in Mississauga. 905-890-7066 ask for Doug. or email: doug@dangerousgoods.ca. Don’t want to be a party pooper either, Love the idea…….got a funny feeling it still might not be worth the cost, hastle or risk. Bet it will still be easier and cheaper in the long run to rent at your destination, go for your ride and be done, unless you plan to be gone for a long time, just sayin…… Do your research and then some. Happy trails! Can you fly your moto from South America to the USA? I wonder if they would take air miles to. Good for you Air Canada! You are making a lot of motorcyclists smile with this transportation option. I was in the process of shipping my bike in May to Europe (Rotterdam) by boat and flying over 10 days later (Amsterdam). This looks like a much better option. The same destination point and less hassle – fewer systems to deal with. Came across this at the recent Montreal Motorcycle show, this may be a viable option for my 2016 Eastern European ride! Those prices are for one way… may be a challenge coming back from Europe. Holy cow , hope this is offered from NL , my trips to Florida just got a hell of a lot better if so. During the show the AC cargo rep indicated that the rider needs to travel on AC to qualify for this offering. The class (type) of ticket will affect the pricing for cargo. I would recommend calling cargo first to see which air fare(s) qualify for motorcycle cargo. You may find out that you have to have a certain class of ticket and be rest assured that it will not be the cheapest ticket available. Now I want to find Air Canada’s Antonio Sammartino’s email address for clarification. Yes Bruce, I would like that email as well! I have a shipment to Buenos Aires booked right now and wanted to know the details on this promotion and hopefully adjust our price accordingly. The call center told me that Calgary was included in the promotion to ship to BA but that I must contact the YYC to get the details. After a little bit of effort an email was returned with the advise that only Frankfort and London are available from Calgary. I have had great help using AC Cargo in the past but some clarification SOMEWHERE would be really nice! This is really great news, the only thing missing is destinations in the US. Being able to ship to california would be great. That’s pretty decent, fare-wise. Flew my bike round trip to Vancouver a lifetime ago (1986) via Wardair; cost about the same as our seat fare and picked it up within an hour of landing in Vancouver. Haven’t heard of anybody else offering such deals since then. That’s because air travel has been stood on its head since 1986. BC tour from Ontario sounds a lot more interesting. Good for Air Canada. Now we have all new options for travel when time constrained. Thats very cool, who would of thought Air Crappy would be accommodating to bikers. I can now do a 2 week cross Canada trip.